WBX Windsor Hydraulic Styling Chair. Elegant, practical design with unparalleled attention to detail and build quality. The Windsor styling chair conveys traditional quality through design and flair craftsmanship to be enjoyed for many years to come. hand built by craftsmen in the UK. Bringing this time-honoured design into the 21st century. the WBX design team have taken this traditional captain's chair frame and richly transformed it to become the windsor, it will grace any salon giving it an immediate sense of character. Whether it is upmarket chic, contemporary, bohemian or a traditional barber shop. The frame has been strengthened to accept and has been tested to 450lbs. Seat and back have been redesigned so there are no crevasses where cut hair can get trapped and it’s “wrap around” contoured seat and back make it very easy to wipe clean. They have used chrome studs to the detailing of the arms and back to contrast with the chrome disc or 5 star base. 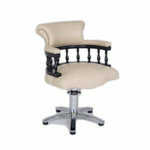 the spindles separating the seat and back can be specially finished to match any colour. The Windsor is available in any colour upholstery with matching wood colour such as oak, mahogany, ash, ebony or to perhaps compliment a silver styling station, available on round hydraulic base or 5 star hydraulic base, both come with a five year guarantee on the hydraulic. Sizes width 660mm, depth 711mm, height 838mm. Available in a host of colours please ring 01270 630280 for colour swatch to be sent out to you.